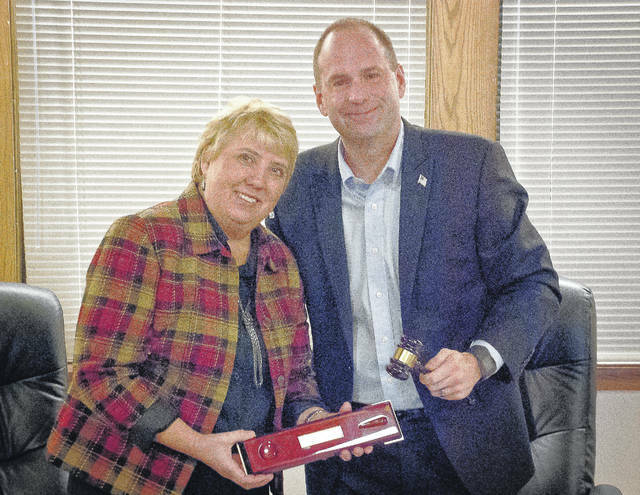 Orange Township Trustee Rob Quigley was presented with a gavel by Trustee Debbie Taranto as a memento of his time serving the township Monday evening. Taranto said he was perfect for the job as trustee. Before anyone claimed the podium Monday evening for public comment, Trustee Debbie Taranto seized the opportunity to make a statement and present Quigley with a gavel as a memento to remember his time serving the township. Taranto said that Quigley always ran his campaign with character and truth; that he always knew what he could and couldn’t do and had set Taranto straight a couple of times. After Taranto’s comments, Quigley was treated to a standing ovation by the Orange Township residents in attendance. Quigley said the board of trustees only sat at the table and that it was the township employees that did the hard work. Quigley said it was great working with the board of trustees and the fiscal office. He also said hiring Lee Bodnar as the township administrator was a great move. Fiscal Officer Joel Spitzer said he and Quigley haven’t always agreed, but their disagreements were always handled with civility. He said that the two built a great working relationship and friendship over the past eight years, which he said has been productive. This entry was tagged Orange Township, Quigley, Spitzer, Taranto. Bookmark the permalink.